It was 1983 when the Church Council through the leadership of Rev. Nelson Frani conceived the idea of putting up a church-owned school ministry that will cater to the needs of the community, providing an affordable quality Christian education to children ages 4-6. This was also envisioned to become an evangelistic arm of the church. It was in the month of October 1983 when the Church Council approved the motion to start a Learning Center. After a careful study and consultation with Ms. Aida Musa, a faculty from Bethel Bible College, the Disciples Child Care Learning Center was opened the following year 1984. 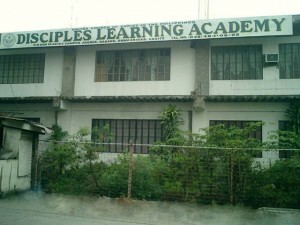 The first teacher was Ms Ofelia Lorilla who is also a graduate from Bethel Bible College. The primer class consisted of few students from the community most of whom were children of church members. The class was held in one of the rooms of the church and Ms Tess Cantada-Camia supervised it. After four years of thriving, God blessed the school with greater number of enrollees in nursery and kindergarten classes. A small building was constructed through the help of the P.T.A. and some church members. This was at the old site, which housed the classrooms for the lower elementary level. Four years after it was opened, Ms. Lorilla moved to a new place and was replaced by teachers Maaliw Alduñar Rizza Serna and Cristina S. Saquilayan. A preparatory class was added later and because of the growing number of children and good report of the school program offering, a permit was readily secured form the DECS using a new name, Disciples Learning Center. Recognition for the Pre-school program was granted by the DECS in 1997 under the administration of Rev. Carlos Dela Cruz who challenged the Church Council to take another leap of faith by branching into Elementary School to serve the community better. Having the same vision-mission goals the Church Council agreed and by SY 1998-99 Grade 1 class was experimentally started continuing to Gr. VI, the first batch of graduates of which was sent off in 2005 witnessing to the completion of the elementary level under the administration of Ms. Amelita Lara. In 2005, a great shift was experienced with the groundbreaking for a new school building on a 1,613 sq.m property purchased by Sabang Church of Christ Disciples. Rising beside the church sanctuary is a four-storey building to accommodate the increasing number of pupils brought by the opening of subdivisions in the area. This great shift also paved the way for a new name, Disciples Learning Academy of Dasmarinas, Cavite Inc. foreshadowing the opening of a high school in the future. Currently the DLA occupies the new school building which is only 2-storey structure yet and with two temporary classrooms at the Westside, back area. With the leadership of Rev. Calipay “Leng” Lubang alongside the DLA School Board, it is envisioned that this school will be a bulwark, a fortress of Christian learning in the community and be a change agent of society through the good news of salvation in Jesus Christ.